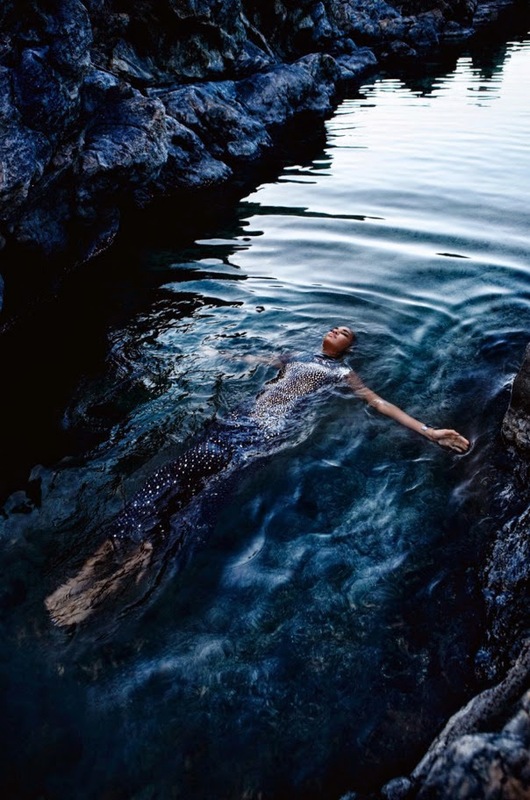 Norwegian photographer Sølve Sundsbø captures Puerto Rican supernova Joan Smalls amidst a magnificent rocky outcrop landscape and while immersed in shimmering still waters for Vogue Italia's May 2014 issue. Smalls is a vision of futuristic glam styled by Anastasie Barbieri in elaborate statement pieces in gold and silver metallic hues by Alexander McQueen, Giambattista Valli, Gucci, Roberto Cavalli, Saint Laurent, and Lanvin. Accessorised to the hilt wearing Roberto Cavalli eyewear, a metallic headdress, necklaces, and bracelets, Smalls high tech look is taken up an additional notch courtesy of hairstylist slicked back hair and intricate face jewellery by hairstylist Duffy and make-up artist Karim Rahman. "Shining" features Smalls at her best as she reclines on a jagged cliff face with the early morning light highlighting her high-sculpted cheekbones and the contours of her spectacular 179 cm lean silhouette. The number 1. ranking model in the world according to Models.com's list of Top 50 Models shows no signs of being usurped with a slew of recent editorial bookings for American Vogue, W, Elle, and Glamour, in addition to Spring/Summer 2014 campaigns for Fendi Eyewear, ICB by Prabal Gurung, and her ongoing Estée Lauder Cosmetics gig.